Punakha offers a multitude of great dining options which will let you enjoy your visit to this beautiful valley. Unlike Thimphu or even Paro, Punakha is a quieter (and a warmer) place so do not expect much variance in cuisine. Your focus on your trip to Punakha should be on absorbing the abundant natural beauty of the region. Incidentally, Punakha is one of the biggest rice producers of Bhutan (white rice) so most hotels and restaurants will serve white rice. Most hotels and restaurants (except 5 and 4 star ones) will not accept cards so come equipped with a lot of cash. There are very few ATM’s in Punakha. Most restaurants in Punakha have an in house bar serving a decent selection of local and international brands. This is the twin of Uma Paro Bukhari that is situated near the Paro Airport. Bukhari is easily the only and the best place to experience fine dining in Punakha valley. Dinners at UMA COMO Bukhari are elaborate affairs under the supervision of Bhutan’s finest chef. Bukhari uses organic produce like apple cider, wild flower honey, local cheese and fresh butter from the villages of Bhutan along with the finest ingredients sourced from across the world to make delicacies like wagyu beef flanks with blue cheese, Hogay salad with pepper, chilli and feta, pates and smoked meat platter and brown treacle tart with ginger and poached pears. The service, ambience and food quality is par excellent and you can also opt to have your meals on the terrace in traditional Bhutanese style chairs while relishing the stunning view all around. A meal for two at Bukhari will cost you 5000 NU. Anyone travelling to Punakha will hear lots of good things about the Lobesa Resort as it’s apparently the best place to stay in Punakha apart from being the only 3-star resort in the valley. 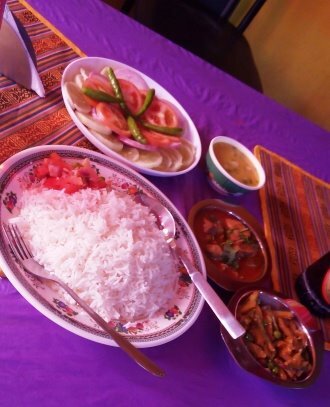 The Lobesa Village Restaurant is the in-house restaurant of the Lobesa Hotel and it offers an eclectic spread of Bhutanese and continental cuisine. They have a daily buffet menu comprising of red rice, momos, seasonal vegetable preparation, ema datsi and ice cream amongst other dishes. The Lobesa restaurant has very nice views of the Himalayan range and vast rolling paddy fields. The staff is quite friendly and will happily explain the nuances of every dish that you taste here. There is a separate room for birthday, anniversary and special celebrations. A meal for two at the Lobesa Village Restaurant will cost you 1600 NU approximately. 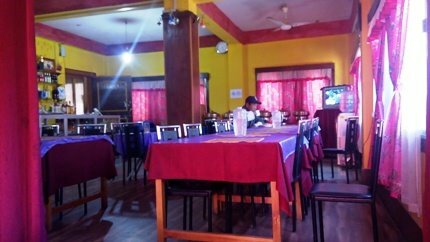 This restaurant is listed amongst one of the prominent restaurants of Punakha. One good thing about this restaurant is that it offers vegetarian food too (this is rare in Bhutan). locally grown vegetables are used for cooking meals here and there is a buffet option on most days comprising of rice (mostly white), lentils, seasonal vegetables and a meat based dish. A meal for two at the Puenzhi Diner will cost you around 1000 NU. The Café of Chimi Lhakhang is sort of a must visit if you are all set for a visit to the mad monk’s monastery. If you want a simple yet tasty place to dine that comes with a fine scenic view, then you will be satisfied with your experience in this monastery. The café faces lush green paddy fields (the green quotient depends upon the season) and you can see the road directly leading to the Lhakhang. Meals are simple with Bhutanese, Indian and Continental options. Beer (and no hard drinks) along with soft drink options are served. If you are going in a big group, you can ask for lunch to be served in a buffet style. The cafeteria is quite clean and the washrooms are a sight to behold with several wooden and metallic phalluses on display (read the Chimi Lhakhang section to know more). Meal for two at this cafeteria will cost you around 1000 NU. Cost of Buffet per person is 450 NU. It’s not expected to find Italian style Pizzas in a place like Punakha but the TenZin Pizzeria does rustle up some mean pizzas. The place is extraordinarily small but the team inside is quite enthusiastic and enterprising. The Devils Pizza or the Extra Chilli Pizza is a must try and so is the veggie mushroom pizza. This pizzeria is near the Lobesa hotel so it’s a must visit if you are staying in the famous Lobesa resort. This is a good option for you if you are bored with Bhutanese food during your visit to Punakha. This is a small unobtrusive restaurant on the first floor of the shopping complex near Punakha dzong. I happened to try it out post my visit at the dzong and I was hungry at that time (driving up to the Lobesa restaurant was not an option). Surprisingly, despite hearing about so many restaurants in Punakha on the different review sites, I didn’t see a single restaurant that was open (it was off season though). So, a local girl was kind enough to point me up to this small restaurant which has a beetle shop on the ground floor. My driver told me “I won’t have lunch…I will only have Doma” (a particularly potent form of beetle nut and leaf. On entering the restaurant I was struck by the bright yellow and pink combination. I ordered a spy cooler, rice and chicken and a seasonal vegetable preparation. I am an Indian and could find no difference in the food that I ate back home and the meal that was served here. The food was good though and I was thoroughly entertained by a colour TV showing an Amitabh Bacchan blockbuster (Bhutanese people are quite fond of Bollywood films and their favourite actor seems to be Salman Khan). There was a major communication issue with the owners and its suggested that you mark down the items you want from the menu instead of trying to communicate verbally. A meal for two here will cost you around 800 NU.